COFFIN HOP: DEATH BY DRIVE-IN is the first collection of stories from the ranks of the annual Coffin Hop online horror extravaganza. Brains from Space! Robot Squids Gone Wild! Radioactive Microwave Men! Monster Mash Massacres! Crotch Tentacles! Werewolf lovin’! Vengeful Gods! Hot-Rod Hauntings! Alaskan Apocalypse! Vampire Seduction! Man-eating Toilet! Robot Lincoln & Zombie Jackson! Featuring interior art by the legendary Nik Seizure and an introduction by B-Movie expert and cult classic Stink of Flesh director Scott S. Phillips! Get your popcorn ready and dim those headlights. The Dusk ‘til Dawn is about to begin, and it’s gonna be killer, baby! 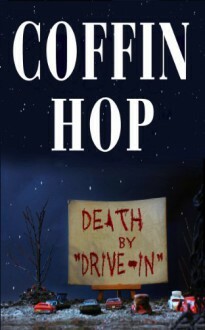 All profits from COFFIN HOP: DEATH BY DRIVE-IN will be donated to LitWorld.org!